Cynthia Blanton Studio: Oh NO!! I know all the discussion of what constitutes copying is having a distressing effect on me as I struggle to "find my own voice" and I hope it is not causing anyone to forego pursuing their ideas. Gera knows me so well. She's right. Living by the ocean here, so its a pretty constant muse, but bet there are many getting ready to make shells and 'dollars, no matter where they are. After a wet/cold winter we're all anxious to bring a bit of spring and summer into our lives. omg...the word "spring" brought another thing to mind...spring cleaning! It's really a shame that so many of us are so sensitive about being perceived as copycats. I've never worried much about that, since I know my own heart and where my work comes from. That approach has had its drawbacks at least once, but I don't intend to change it. How funny that you both have the creative need for shells at the same time. Thanks for showing the pictures of your molds. You are correct that we shouldn't be afraid to show what we are making. There will always be some similarities. People have made jewelry items from seashells, and everything else possible to use that can be made to look like a seashell. I think you are safe in the seashell department of creation. when replicating natural shapes like a seashell, the issue of copyright is pretty moot. 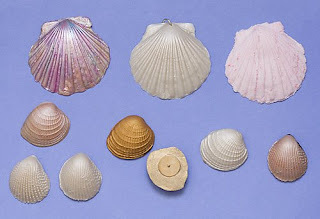 Nature created shells, and we freely admit to copying the forms and colors! Many pc artists have already "been there, done that". I hve a how-to for making faux seashells and coral in my book "Create A Polymer Clay Impression, and its been out for years. Nor was I the first (or the last)to think of it; we all take inspiration from nature and nobody holds that copyright--only the writing and photos get to have copyrights applied! Great post-- the only people who have an honest right to rant about copying are the ones who can absolutely, positively say that they never, ever did anything derivative. And that's nobody, of course. All art is derivative.